Sofia has the perfect combination of relaxed boho vibes and a classic cut that won't become dated in future decades. The sheer Made With Love Frankie bodice is combined with a floaty A-Line chiffon skirt, which is lined with satin. I chose this dress because it's simple but striking, particularly with its dramatic and flattering open back. The flowing skirt is light and comfortable, and not at all clingy, so you won't have to sweat the night away in Spanx. While I still love this dress, I chose it before I'd made any solid arrangements for my wedding. 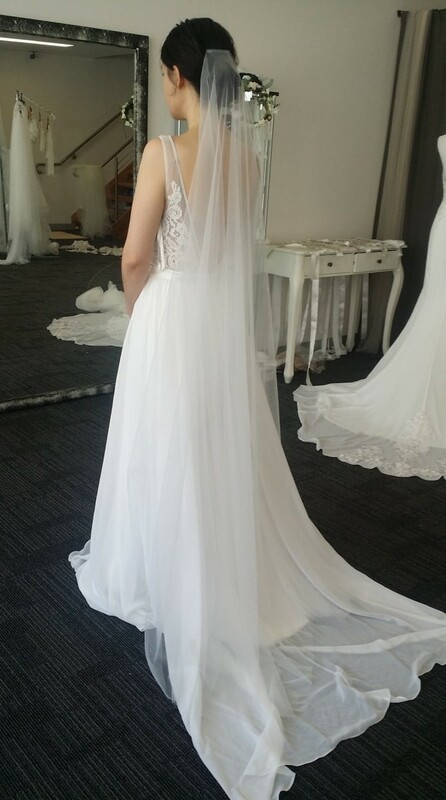 I regretfully decided that a different dress would better suit what has turned out to be a different style of wedding to what I was initially planning. This dress has only ever been tried on. To see how beautiful this dress looks on real brides, check out #mwlsofia on Instagram. Veil wasn't purchased and is not included. Buyer to pay for postage. A seamstress has hemmed the dress (I'm 163cm plus wearing 13cm heels in the pictures taken at home) and has replaced the original (approx B-size) bust cups with A cups. The original cups will be included with the dress and can very easily be put back in.